Home #ASSE #industrialhygiene #industrioushygienist #occupationalhygiene #safety #Safety2016 Arizona Health and Safety Summit free safety training GHS lab safety Piper Pangolin SDS Sock Puppet Safety We won first place in ASSE Region 2's OSH Independent Film Festival Contest! We won first place in ASSE Region 2's OSH Independent Film Festival Contest! I'm thrilled to share that our latest Sock Puppet Safety video, "Yay for Lab Safety!" won first place in the American Society of Safety Engineers (ASSE) Region 2 OSH Independent Film Festival. The video starred Piper Pangolin, Lemmy Lemur, and two friends. Piper Pangolin, Industrial Hygienist for Mad Labs, sharing her love of safety! Thanks to the judges of the contest for their encouraging votes! The Exceptional Spouse and I will use the prize money to fund our time and materials for more Sock Puppet Safety videos. As a member of the Arizona Chapter of ASSE, the Industrious Hygienist was a speaker at the 2016 Arizona Health and Safety Summit that occurred this week. The session was titled "Do-it-Yourself Safety Data Sheets" and was part of the ASP/CSP preparation track. The breakout session presented by the Industrious Hygienist was written to provide attendees with the knowledge to review safety data sheets (SDS) for accuracy. It also taught attendees how to prepare labels for containers based off of a SDS that was *mostly* compliant with the requirements of the UN Globally Harmonized System for the Classification and Labelling of Chemicals. The session discussed how to write and update a SDS, since some manufacturers are moving slowly on providing GHS-compliant SDS. In the breakout session, we used a partially GHS-compliant SDS for a made-up chemical called "Wilburn Superflam 70%" to show attendees how to review an SDS for accuracy. 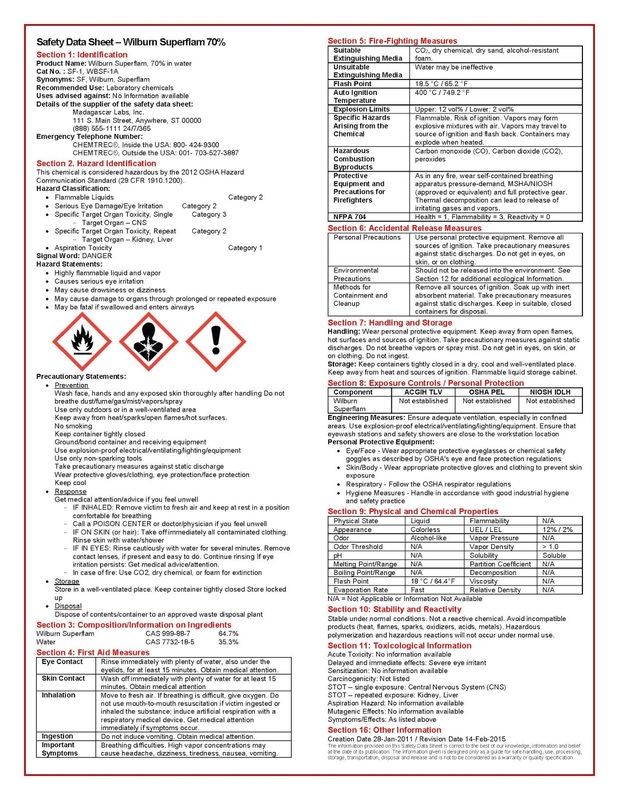 SDS for Wilburn Superflam, 70% used in ASSE Arizona Health & Safety Summit (2016). Using the SDS pictured above, the Industrious Hygienist showed attendees how to prepare a container label (like what would be provided by a manufacturer) using the GHS-compliant SDS. 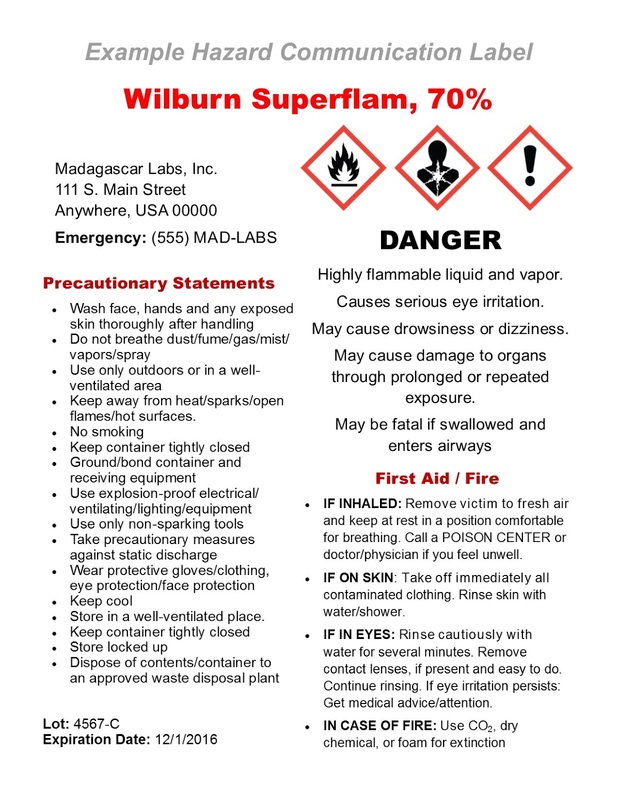 The example hazard communication label for Wilburn Superflam 70% is shown below. 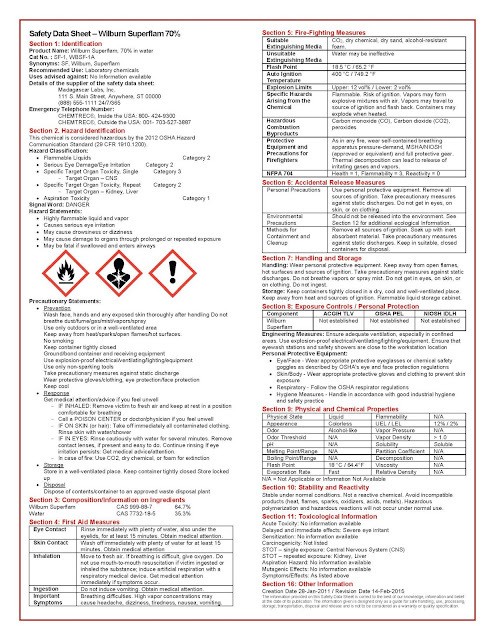 Example hazard communication container label for Wilburn Superflam, 70%. Our next Sock Puppet Safety video(s) will probably be Piper Pangolin giving specific sections of the "Do-it-Yourself Safety Data Sheets" presentation, and teaching how to develop labels and review SDS. She'll be educating the internet on the chemicals shown in the "Yay for Lab Safety!" video: Wilburn Superflam 70%, Wilcorr Meltymess 25%, and Wilkil Allifes 15%. Watch for more fun and entertaining Sock Puppet Safety videos in upcoming months.